Jean-Jacques Muyembe has devoted the last four decades to researching Ebola virus disease. He worked on the World Health Organization (WHO) team that implemented detection and control measures in the first documented urban outbreak of Ebola in Kikwit in 1995 in the Democratic Republic of the Congo. 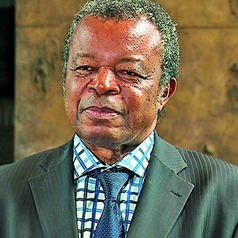 Muyembe is Director-General of the National Institute for Biomedical Research and Professor of Microbiology at Kinshasa University Medical School in the Democratic Republic of the Congo. He worked at the Institut Pasteur de Dakar in Senegal in 1981 and the US Centers for Disease Control and Prevention in 1981 in the Special Pathogens Branch for the study of Ebola and Marburg viruses and has chaired several international committees for the control of Ebola outbreaks. He was appointed dean of the Faculty of Kinshasa University Medical school in 1978, having received his PhD in virology from the University of Leuven in Belgium (1973) and graduated in medicine from the University of Lovanium in Kinshasa (1969).